But sometimes Erin thinks the most beautiful part of her work is the glass itself. 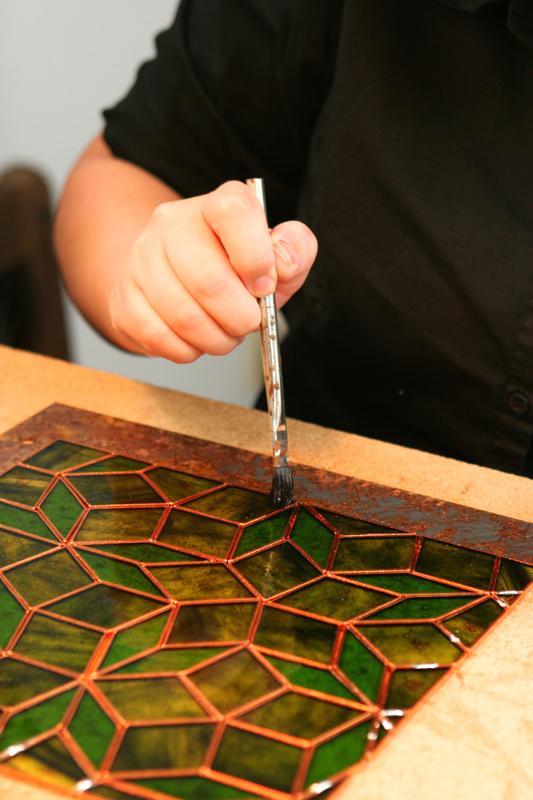 “I often look at a piece of glass and wonder how I could possibly improve on it, as it’s so beautiful on its own,” she says. “But instead of putting the whole thing in a frame, I force myself to cut it up and getting working on a project.” And then she makes her own lovely things. 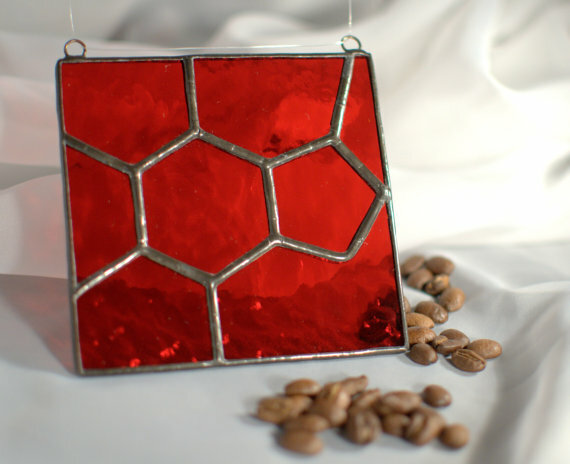 Erin’s scientific background weaves itself into her work as some of her best selling stained glass pieces are sun catchers, based on two-dimensional representations of molecules such as caffeine, serotonin or dopamine. 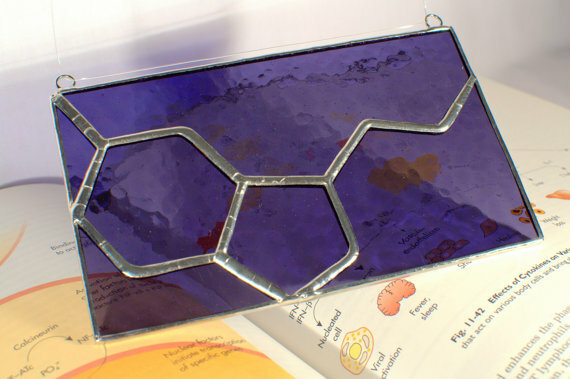 “I have also done some large mathematical-themed panels based on Penrose tiles, and a few smaller items inspired by Star Wars and Dr. Who which speaks to my geeky, science-y side,” says Erin. Erin also takes her love of glass to bottles: old bottles she refurbishes by sandblasting and etching to create drinking glasses, vases, candle holders and even serving platters. In fact, you can see Erin’s drinking glass handiwork at Imbibe Food/Drink and The Boathouse, both in downtown Kitchener. And if you think her talent ends at glass work, you’d be mistaken. She is also a musician, actor and stage manager for community theatre. She is the Erin behind Erin and Company, a duo who plays local venues, and she plays saxophone in the Hep Cats Hoppers studio swing house band. She can also be found behind, on and in front of local theatre stages. Having first found a love for musicals in university, she acted and then became more interested in theatre tech, turning to stage managing productions. Lately she is returning to acting and performing in theatrical orchestra pits as a musician. In fact, she says she will play a woodwind instrument in any local theatre orchestra that will have her. And to blend her two worlds nicely, a large stained glass piece she created hangs over the main entrance of the KW Little Theatre in uptown Waterloo. That’s some nice symmetry. 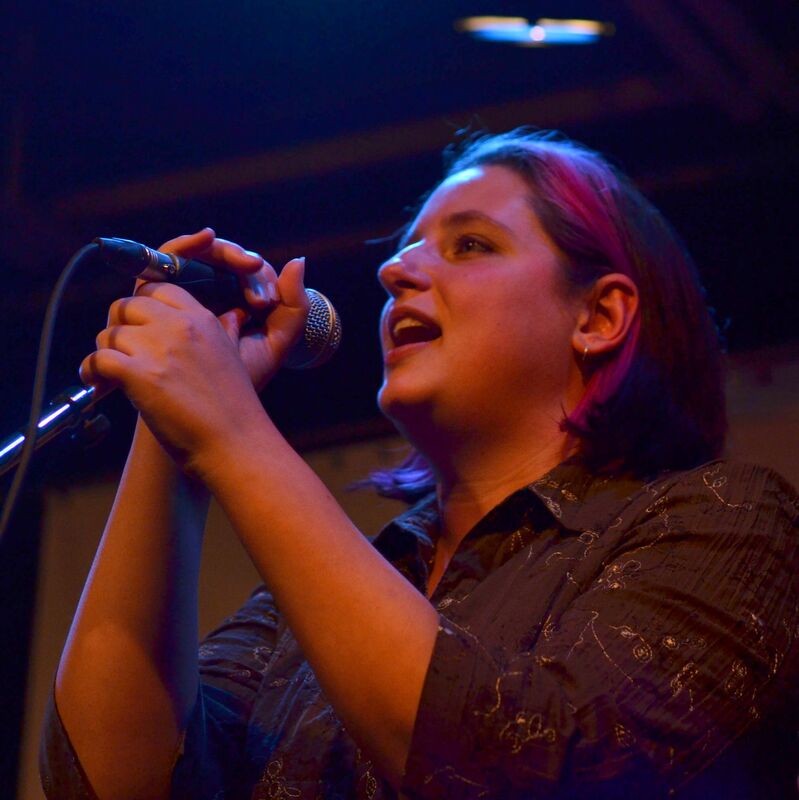 You can catch Erin perform her musical talents at Imbibe Food/Drink on March 27 and watch her in the role of Rosencrantz in KW Little Theatre’s production of Hamlet in April and May. Keep up with all of her creative action on Twitter. P.S. Erin’s favourite topics of conversation: curling and birds. On any day or night of the week you can find two young men in downtown Kitchener, with headphones on and grooving out to some music. But they aren’t hanging on a street corner; they are in their recording studio, Sound Distillery. 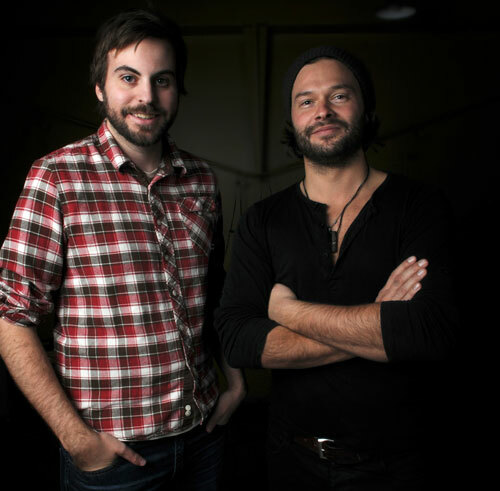 William Muir and Dave Houde are the music engineers and producers behind Sound Distillery, a full-service recording studio that focuses on working closely with musicians to deliver a unique, quality result. 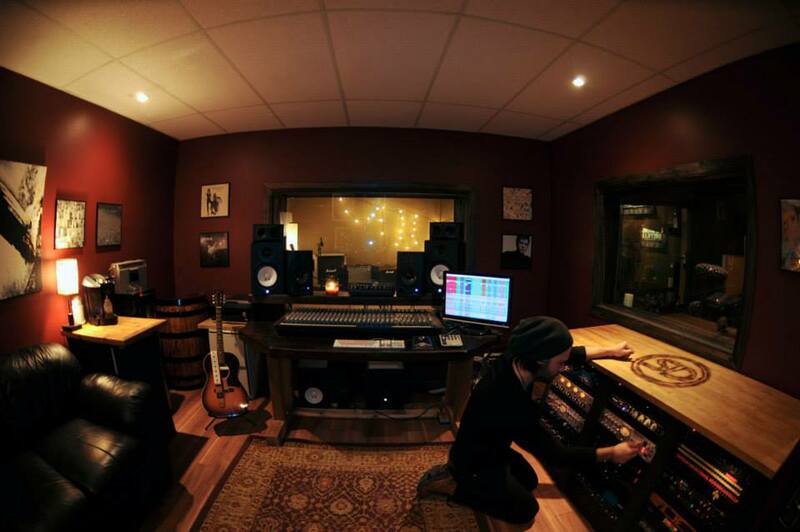 “We are a small studio and provide every element of musical production people need – recording, mixing, producing, editing music and video, as well as artist development,” says Will. 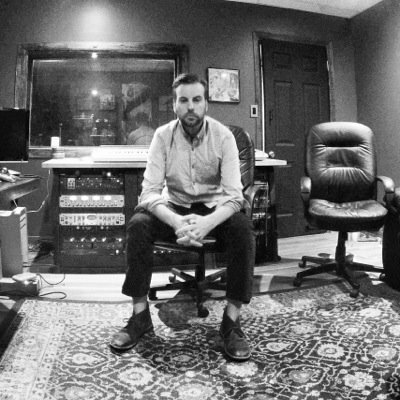 As the youngest producer/engineer team in the region, Will says they can offer their clients a unique advantage. “We connect with our musicians and their audiences in different ways – Facebook, Twitter, Instagram – and are prepared to help our musicians long after the recording process to really see them succeed,” he says. Will says he would love to work with local musician Danny Michel, who he has always been impressed by, as well as Bruce Springsteen. “Why shoot for anything less that the biggest rock artist in the world?” he says chuckling. Will Muir in the studio. As you can tell from their approach to supporting artists beyond the recording studio, Will is community minded. He is currently working on a side project for at-risk youth, building a creative space where they can learn, create, explore and evolve in the arts community, by providing access to the needed tools, technology and mentors. Keep connected to Sound Distillery to learn more about this. P.S. Will`s favourite topic of conversation: [wait for it…] Music.